The weather forecasts predicted a rainy day today, but it turned out to be sunny and green. 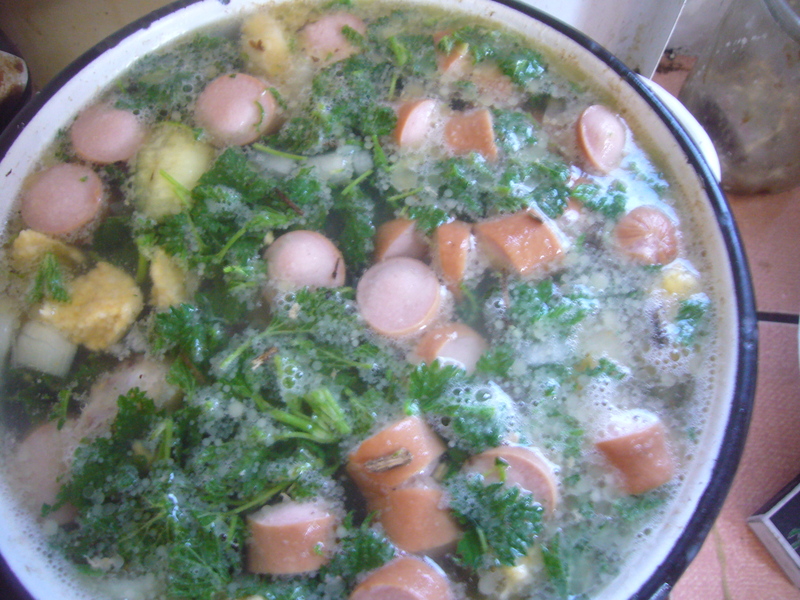 So, I cooked another one of traditional Ukrainian soups, the nettle soup. This green soup is very healthy and rich with vitamins. Stinging nettle along with ramson are the first greens in Ukraine. And, they are free! We use only the first, young and tender nettle leaves. They almost sting free. Still, I used rubber gloves to pick the nettle for my green soup. I have nice young bush of it growing right in my yard. Make a broth. I used both chicken and hot dogs for it. Then you add some potatoes, carrots and onions. You may also add 2 chopped garlic cloves into the broth. And, add rice. I added 3 table spoons of it. Let the whole thing boil till rice and potatoes get cooked. Then, at the very last moment you add some chopped nettle and green onions. I also add a table spoon of sunflower oil at the very end of it. I turn the heat off and let the green soup stay for half an hour to get the nettle cooked. This Ukrainian nettle green soup should be served hot with sour cream. This entry was posted in Easy Recipes and tagged cooking, dinner, dinner ideas, easy cooking, easy dinner recipe, ethnic cuisine, food, green soup, healthy cooking, heatlhy soup, lunch, nettle, nettle soup recipe, Ukrainian cuisine, Ukrainian green borsch, Ukrainian nettle soup. Bookmark the permalink.